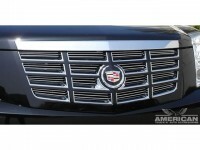 20194: 07-14 Cadillac Escalade Polished Billet Grille Insert. This polished billet grille insert replaces the stock plastic square mesh behind the grid and mounts from behind the grille openings. Approximate installation time of about 1hr and comes with complete directions and hardware. Backed by five year manufacturers warranty. Made in USA.